M.V.Lekshmanan (1939 – 2008) was born in Mayanoor a remote village in God‟s Own Country, Kerala, India. From a very modest beginning he went on to retire as Marketing Manager from State Trading Corporation (STC) of India Ltd. He has traveled widely within India, Europe and Asia. He was full of energy and life. After his retirement he took up his hobbies with such passion and zeal that left us gasping. He enrolled on a Carnatic music class, wrote four short novels, a collection of poems and a script for an English Movie. 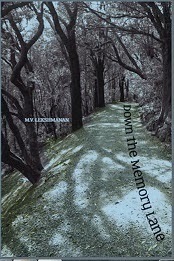 “Down the Memory Lane” a collection of his poems was released in print to few of his family and friends,to preserve his memory amongst us for generations to come. I went through it repeatedly last five years and thought it might just probably have a wider audience than his close circle and hence releasing an e-book version. He was probably close to giving his first stage Carnatic Music performance at the age of seventy when the will of GOD snatched him away from us. His all time favorite quote was “You have right to actions alone not to its fruits” from “The Bhagavad Gita”. I have few copies of the print edition available with me and I would be more than glad to send it across to anyone who like the e-book version. If you like, please spread the word. In case you do not like, all mistakes are mine! I have tested both in epub readers and kindle readers across a variety of devices (PC, Android devices. Drop me a note if you have any difficulty in getting in onto your reader on any platform.